Wet basements in Grand Rapids, Lansing, Kalamazoo of Michigan are a problem in new and old homes alike. They are particularly troublesome because of all the damage that can result to a homeowner's belongings, and the solutions can be disruptive and expensive. If you're building an addition onto your home or building a new house, be sure to ask your builder what the plan is to keep the basement dry. Dampproofing is not enough, and typical exterior waterproofing alone fails over time. CactusBoard foundation waterproofing is the solution for new home builders that is easy, inexpensive, and warrantied for 20 years! 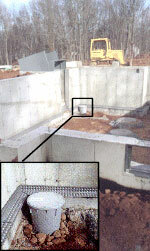 The CactusBoard foundation waterproofing product forms a space between the edge of the basement floor and the wall, and across the footing, allowing all the water from the perimeter and the walls to drain down into the stone aggregate under the floor, which is drained by a sump pump or footing drains. CactusBoard is the only product that can ensure the floor stays dry regardless of what happens with the walls or footing drains. Just keep the stone bed under the floor drained, and your basement remains dry forever! Ask your builder about CactusBoard, and especially ask them what they plan on doing to keep your basement dry! For more information or to purchase CactusBoard, go to the CactusBoard.com website. Now there is a Foundation Waterproofing solution for new home builders that is easy, inexpensive, and warrantied for 20 years! CactusBoard floor edging forms a space between the edge of the basement floor and the wall, and across the footing, allowing all the water from the perimeter and the walls to drain down into the stone aggregate under the floor, which is drained by a sump or footing drains. Cactus Board is the only foundation waterproofing product that can ensure the floor stays dry regardless of what happens with the walls or footing drains. With this Dry Basement System, just keep the stone bed under the floor drained, and your basement remains dry forever! 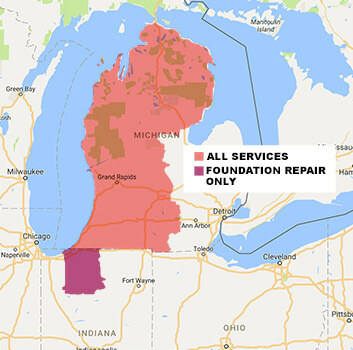 We service East Lansing, Jackson, Battle Creek, Portage, Kalamazoo, Holland, Kentwood, Wyoming, Walker, Norton Shores, Muskegon, Mount Pleasant and surrounding in Michigan. To learn more about our basement waterproofing system, call or e-mail Ayers Basement Systems today.